It’s a bird, it’s a plane….nope, neither. It’s Ripstick Girl, zipping down the SMU Boulevard in all of her glory and swagger. There are few SMU students who have not heard of or seen “Ripstick Girl” around campus. Amelia Eskridge is her name, and if you saw her apart from her blue Ripstick with red flames, you would never expect her to be a rough rider. While she has mastered the art of riding a Ripstick with grace and vigor, Eskridge doesn’t consider herself very athletically competitive. “I was never huge into sports because whenever I would play, if I could tell the other team wanted it more, I would think ‘maybe, they’re just having a bad day – they probably need this win more than I do,’” Eskridge said. Often also called a Wave Board, a Caster Board, a vigorboard or a RipStik, this hobby and transportation device is a two-wheeled and human-powered land vehicle. It is somewhat like a skateboard, but it has two narrow platforms that are joined by a torsion bar. Her hobby began in fifth grade, when she saw other kids riding Ripsticks around and she asked her dad if she could have one. Shortly thereafter, her dad taught her how to ride and before long, Eskridge and her best friend in fifth grade were able to ride in unison, sling-shotting each other up and down the street. Since then, she has even taught three of her four siblings how to ride, and the family often rides together. “I wouldn’t be surprised if this turned into something that I were to pass down generation to generation,” Eskridge says with a laugh. 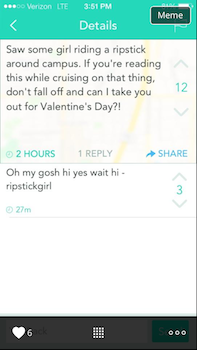 Eskridge is especially amused by the attention she receives on YikYak because of her Ripstick-riding hobby. Sometimes, she admits, she even goes out riding on the Boulevard just to see how many people will Yak about her. One of Eskridge’s favorite memories this semester was a love note from a stranger on YikYak on Valentine’s Day. But what happens when Ripstick girl’s Ripstick is no longer in her possession? The current status of her beloved wheeled land vehicle is unknown, after Eskridge let some fraternity men borrow it about a month ago. Meadows School of the Arts will have a brand-new publication collaboration between its own Division of Art and Pastelegram’s Coronagraph, an online publication of interviews between art thinkers. SMU will have faculty, students and alumni included in several of the interviews with art thinkers. So far, Coronagraph has published three interviews: Kader Attia with SMU’s Chair and Associate Professor of Art Noah Simblist, Asher Hartman with Carol Cheh, and Mary Walling Blackburn with Andres Laracuente. Simblist’s interview discusses themes such as modernity, quantum physics, self-scarification and colonialism in Attia’s 2014 installation, Injury Continuum at Artpace San Antonio. Cheh talked with Hartman about his history in experimental theatre, his work at Machine Project, and his influences and other performance art in the Los Angeles area. Laracuente’s interview focuses on Blackburn’s work and travels in the borderlands. Pastelegram, a non-profit arts organization based in Austin, Texas, focuses on projects that explore artists’ archives and artistic process. It does so by cultivating new works from living artists and maintaining online collections of artistic working materials. A method for examining contemporary visual work, Pastelegram looks at various sources that has affected a work’s creation. Students nationwide are applying to SMU’s film department, and for good reason. Daniel Tomlinson (B.F.A. Film and Media Arts, ’14) continues to use his experiences and knowledge from Meadows School of the Arts as a filmmaker post-graduation. Before he graduated, his film “Welcome Home” was chosen as part of the college shorts showcase for the 2014 Dallas International Film Festival, which was held in April of this year. The 12-minute film was premiered at the Angelika in Mockingbird Station, and it focuses on a young man named Ryan, who returns home after nine months of deployment in Iraq. He is welcomed back with a surprise party thrown by family and friends, but at the party, things begin to unravel in a way he never would have imagined. The film won Best Student Film at the Los Angeles Cinema Festival of Hollywood (LACFH) and it was shown at the fourth annual Glen Rose Neo-Relix Film Festival in Glen Rose, Texas in March earlier this spring. Tomlinson won the 2014 Nash Parsley Memorial Award for Outstanding Creative Achievement for the Division of Film & Media Arts. Tomlinson carved out some time to talk about his experiences with the film as well as his experiences as a student at SMU’s film program. Ally Van Deuren: What is your film about? Daniel Tomlinson: This film is based off of true events, (some experiences from myself and some from others). I did my best to throw as much as I could together while keeping the story in tact in regards to the experiences I could pull from. The film is about someone in the military who comes home after being deployed and discovers that his expectations of his own reality are not real, (in regards to the relationship with his girlfriend and best friend). The main character, Ryan, has returned home expecting things to be exactly the same as the day he left, without accounting for lost time and changed feelings. AVD: Where did you get your inspiration for the film? DT: I was in the Marines from 2001 – 2009. I have plenty of my own “Dear John” stories to tell in addition to other Marines’ stories that I had the pleasure of hearing. In fact, I probably have a few thousand stories to tell about my time overseas in Iraq and Afghanistan (some good and some bad). The goal of this short film was to use the military element without making it about the military. The entire process has been eye opening. The response to the film has already exceeded my expectations and I am very flattered by it. I am glad that I can give the film department at SMU some well-deserved recognition and exposure also. AVD: When did you get your start in film? Did you always know that you wanted to go into the field? DT: Technically, I didn’t get my start in film until about 2004 when I began filming weddings with Plug Video Productions in Yorba Linda, CA. Realistically; I began pursuing my love for film after I saw the film, “The Fifth Element” when I was 13. It was after that movie that I began taking theater classes in school and making cheesy home movies with friends. Coincidentally, I also made the decision to be a U.S. Marine that year (I had to wait 5 years for that). I basically made a plan at 13 to join the Marines in order to help pay for film school and get out of my small little town of Granbury, TX. The rest I just figured out along the journey. AVD: What is next for you? DT: I see myself pursuing my love of film for the rest of my life. Being an art form, there is always the risk of struggle. Simply put, that is also what makes it beautiful. Only people who understand risk, in whatever profession they work in, will understand that completely. I moved out to California in February ‘14 to be with my fiancée and pursue my goal (no longer a dream) of being a director of photography and making movies. I also have just been hired to write my first feature length screenplay and look forward to being a part of the filmmaking process in any regards. AVD: How has the film program at SMU prepared you for a career in the field? DT: The relationships I made and the opportunities provided to me while attending SMU are priceless. The education provided in regards to on-set etiquette and story structure will remain with me forever. Ironically, it was the Marines that prepared me for the mindset of doing a lot with a little and knowing how to circumvent problems on a film set. It’s probably the reason that some things don’t bother me. You just find a way to solve the problem without complaining. I never would’ve found myself interning with AFI (American Film Institute) and Panavision had it not been for my time at SMU. I mean, how many times do you get to say you literally bumped into Morgan Freeman at an awards show? I think the program at SMU has helped me become very well-rounded in regards to filmmaking and not let me pigeonhole myself into one specific area. The professors at SMU have also been important in stressing that the entire process is subjective and that listening to opinions early on can help you more than you realize. I remember talking to Professor [Sean] Griffin while I was literally in the middle of Baghdad, Iraq about the admissions process. Beyond the filmmaking process itself, it has been a pleasure to attend SMU. It went by too fast. It’s good to know that a conversation can go a long way. To mean, that means a lot. I plan on making the University and my professors proud. That is how I am prepared. A little motivation goes a long way. Originally published on the SMU Meadows School of the Arts website. Robin Rose (M.A./M.B.A. Arts Management and Business, ’10) describes how Meadows’ arts management graduate program prepared her for a lifetime of learning. When asked about the highlights of the program, Rose says the workload, among other things, stood out. Another highlight was the numerous talented faculty members who were always willing to help. While at SMU, Rose interned for Big Thought as the manager for an education project for elementary schools. Big Thought provides creative learning programs that help kids excel academically and put them on the road to becoming imaginative and productive adults. She also interned in the development department at WaterTower Theatre, where she focused on events and corporate relations. Rose returned to the WaterTower Theatre for her final practica because the theatre wanted to hire her full time after graduation. However, after examining her offers, Rose went to work at Dallas Theater Center (DTC), where she is now manager of corporate relations and events. Rose says that she uses the skills she learned while at SMU, namely the abilities to network, budget and work in a group setting, in her job at DTC. “Now that I do corporate fundraising I am finding that it was important for me to learn how to interact with corporate executives and begin learning and following the corporate landscape in Dallas,” Rose says, who took advantage of networking opportunities while studying at SMU. Rose explains that without her budget training from the arts management program, she would not have been equipped to monitor DTC’s complex and detailed budget as closely as is needed. Finally, Rose explains the importance of group work in her education and application in the field. Find out more about the M.A./M.B.A. program at SMU. 8-29-2014: Interview with Jenna Skyy! I am happy to be continuing my work at Meadows Marketing and Communications this semester. I’ve been able to write some fascinating stories and interview some incredible and successful alumni. A few weeks ago, I was lucky enough to chat with Joe Hoselton/Jenna Skyy. Here is the Q&A! 8-15-2014 I first had the opportunity to go to the Nasher Sculpture Center in the Dallas Arts District in the fall of my freshman year. Our Dramatic Arts Today professor in the division of theatre at SMU Jim Crawford took our entire BFA class on a tour of the Nasher, the Dallas Museum of Art, along with various theatres, performance halls and other venues. Since then, I’ve been lucky enough to go several more times, often just to peruse and other times for specific viewings and events. I took this photo on one of the Nasher free Saturdays in the spring, where all kinds of programs and activities are offered for the whole family. I found this shot particularly intriguing because I caught this young girl in the act of diligently completing her drawing. The Nasher was packed with families on this particular Saturday, which was a joy to witness. Every thread, hue and button of Hunter Dowell’s designs has a deeper meaning. A first-year graduate design student in SMU’s Meadows School of the Arts theatre department, Dowell specializes in costume design. Dowell is currently working on the designs for Middletown by Will Eno, a play that will be produced in the Margo Jones Theatre in April as part of the theatre department’s Rep series. Dowell explains that as a designer, he is expected to meet several times with the lighting designer, the set designer and the director of the production. How is this team of designers going to translate this to the stage? Dowell says that the leads of the production will have a basic uniform, but will be given accessories to transform them from scene to scene. Something crazy, perhaps, and also, the world of the play. Dowell says that his personal aesthetic does not differ much from that of Middletown. How did Dowell get started in design? Dowell was born in Joplin, Missouri, a small town of about 50,000 people in Southeast Missouri. He received a full ride to study acting in the theatre program at Missouri Southern State University (MSSU), where he participated primarily in children’s theatre and musicals. Dowell believes his background in acting feeds his work as a designer. He said that he had a teacher at MSSU that pushed him and told him that he needed to try designing. The play he designed ended up being Dead Man’s Cell Phone by Sarah Ruhl, now one of his favorite shows of all time. After graduating from MSSU in 2013, he went to the University/Resident Theatre Association (URTA) in Chicago and interviewed with several schools. This is when he was introduced to the representatives from SMU. While Dowell has an emphasis in costume design, the three-year graduate design program at SMU is an M.F.A. degree in stage design.